Jesus. He’s what’s for breakfast. 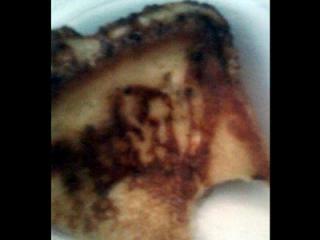 Troy Eckonen was eating breakfast at Mack’s Cafe in Pompano Beach last Tuesday when he spotted Jesus’ face on his last piece of French toast. After studying the toast Eckonen says he and friends also see Christ’s left arm raised and holding a cross, as well as two birds over the left shoulder. Looks more like Frank Zappa to me.